Brazilians were the first to raise cattle in South America, imported from Cape Verde to São Paulo in the 1530s. 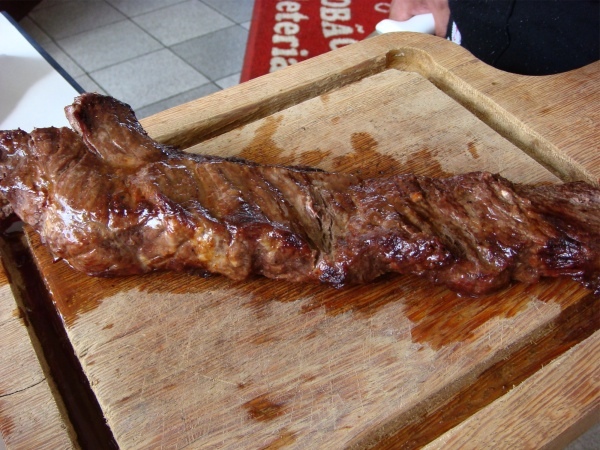 Churrasco (pronounced shoo-RAS-koo) or Brazilian barbecue was the traditional staple food of the gaúchos or cowboys of Southern Brazil for centuries before it spread to Rio de Janeiro and São Paulo. 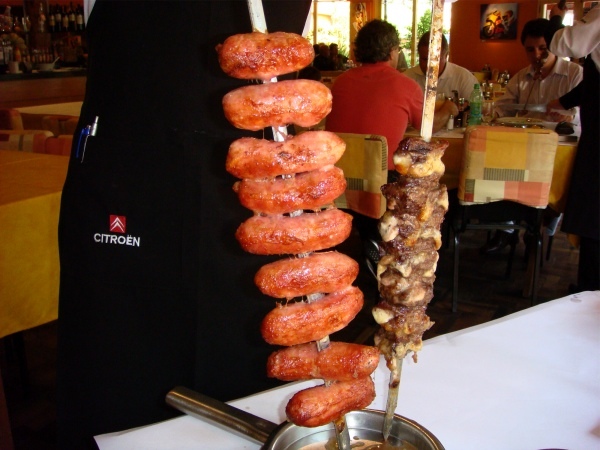 It has become very fashionable and there are excellent churrascarias (restaurants specializing in Brazilian barbecue) all over Brazil and around the world. 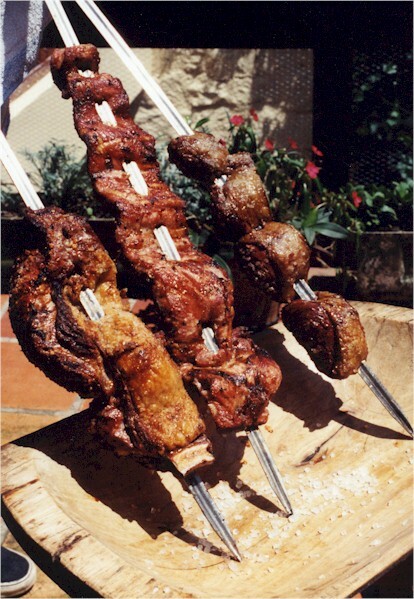 These are called churrascaria de rodízio because waiters move from table to table bringing different types of meats on skewers from which they slice portions onto your plate. 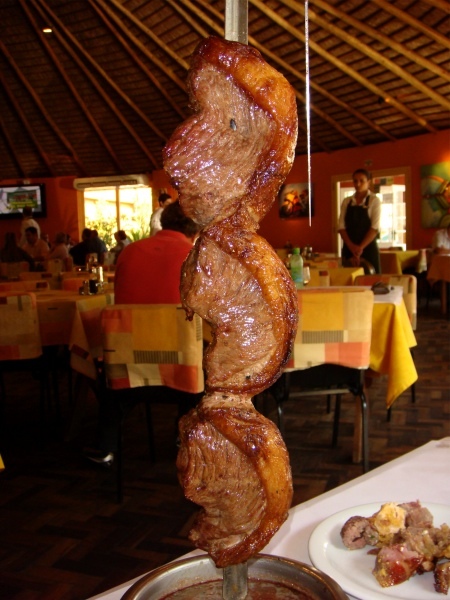 Almost any occasion can be celebrated with a churrasco: birthdays, christenings, political rallies, or it can be a simple get-together with your family and friends on the weekend. It has evolved into an elaborate meal, with different salads, sauces, and farofa accompanying the meats. We start with caipirinhas, served with nuggets of sausage skewered on toothpicks and end with pudim de leite (Brazilian Style Flan) or torta de banana (Brazilian Style Banana Pie). Churrascarias these days have an amazing (and, sometimes, quite unexpected) selection of desserts. Check the pineapples on the photograph at the bottom of this page. For that, you'll need two fresh, ripe pineapples, brown sugar, and cinnamon. Very easy and delish! 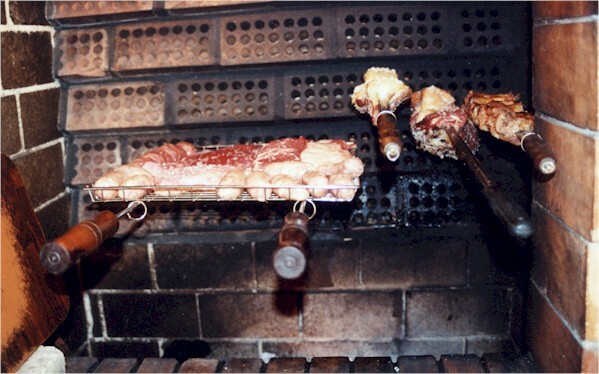 The meats used most often are Brazilian sausages, different cuts of beef, pork tenderloin, and chicken. 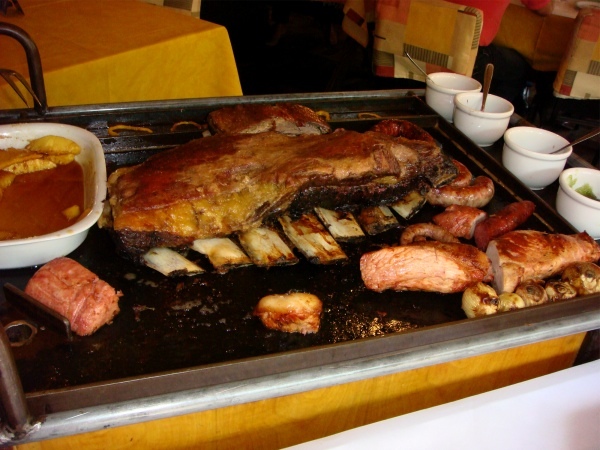 In the U.S., you can use chouriço or a good spicy pork sausage if you can't find Brazilian sausages, t-bone steaks and sirloin strips, chicken thighs and drumsticks, and the pork tenderloin or pork chops. 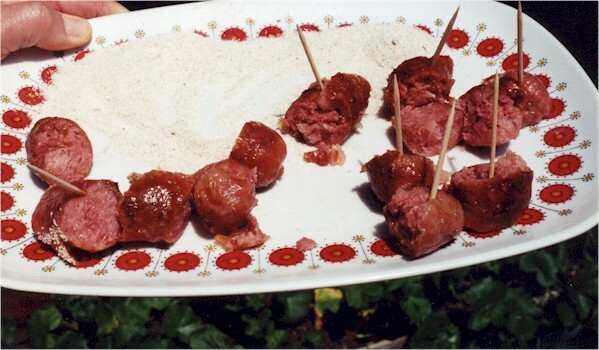 In Brazil, there'll be chicken hearts, turkey breast, different cuts of meat wrapped in bacon or filled with cheese, etc. Serve a potato salad with carrots and chayote, tomato salad with hearts of palm, onion salad, fried manioc or yuca, farofa and molho à campanha (Brazilian Style Hot Sauce) with the meats. White meats are marinated overnight in a mixture of garlic, salt, and lime juice. The red meats are seasoned with sea salt only. 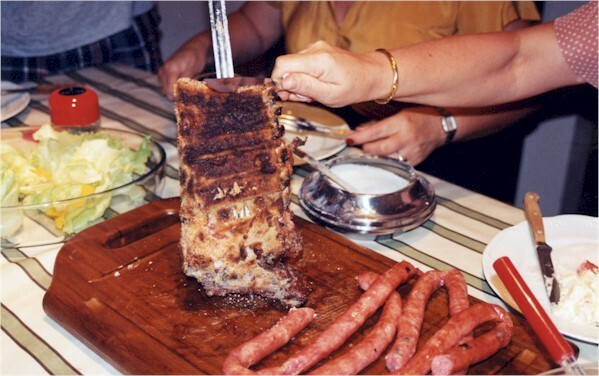 There are two traditional methods for doing this (we prefer the first one): press a good amount of salt into the sides of the meat and once the meat is cooked knock it off with the side of a large knife, or baste the meat with salt water using a bunch of parsley or bay leaves as a brush. 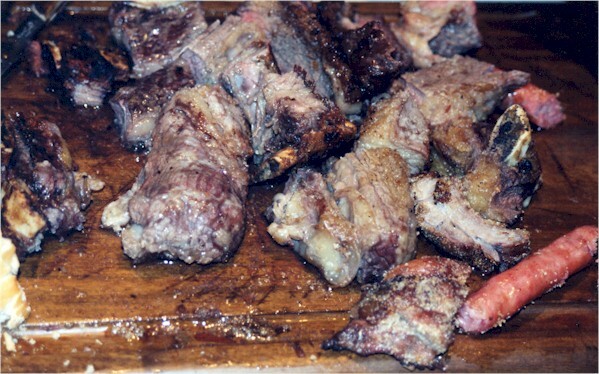 You may want to add this recipe for pork short ribs marinated in red wine and barbecued with farinha de mandioca to your menu. Given to us by our Brazilian cousin in Porto Alegre! 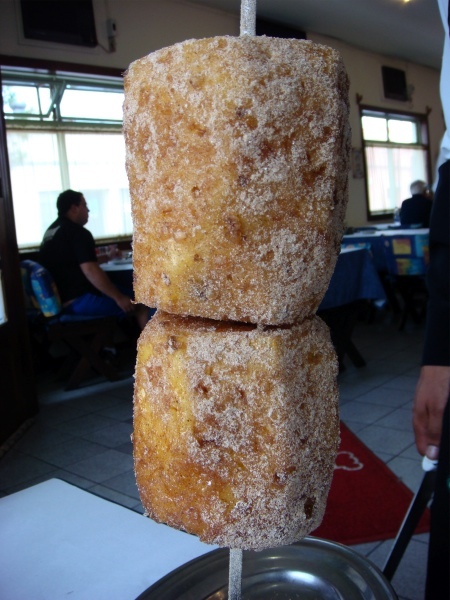 From here, you can jump to our pages about Rio Grande do Sul: Vale dos Vinhedos and Charqueadas. There are some great photos and a bit of history and surprising stuff, too! If you don't eat meat, but don't mind accompanying your friends to churrascarias, they usually have pão de queijo and fantastic salad buffets, too.